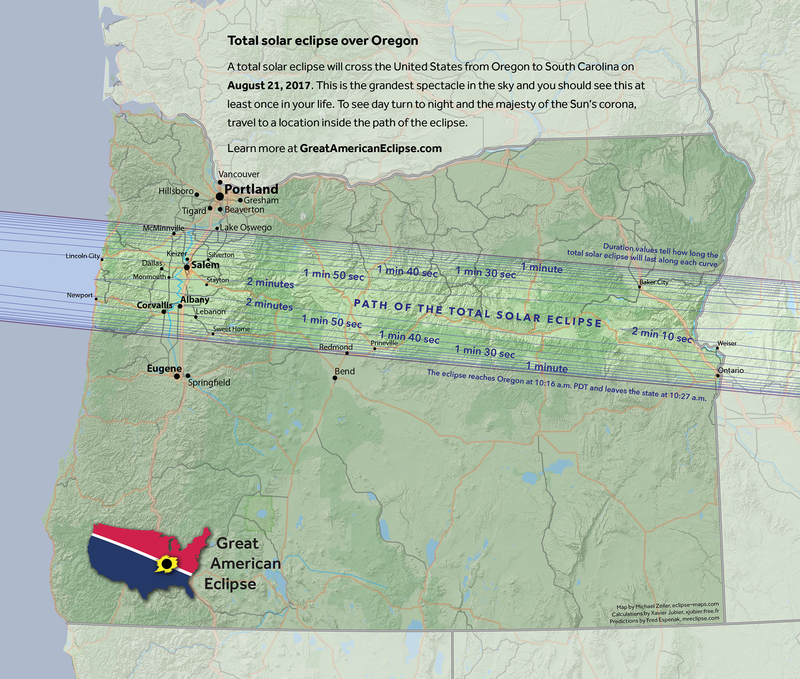 We are less than 1 year away from the biggest astronomical event Oregon has seen in over a generation. There will be a total solar eclipse in our state from 10:15-10:30am on August 21st, 2017. That means Oregon will be cut in two by a ribbon of total darkness for 2 minutes. The shadow of the moon will pass along a line from Depot Bay to near Ontario. It will continue all the way into the SE USA by early afternoon. This will be the first time since 1979 that we’ll see a total solar eclipse here. 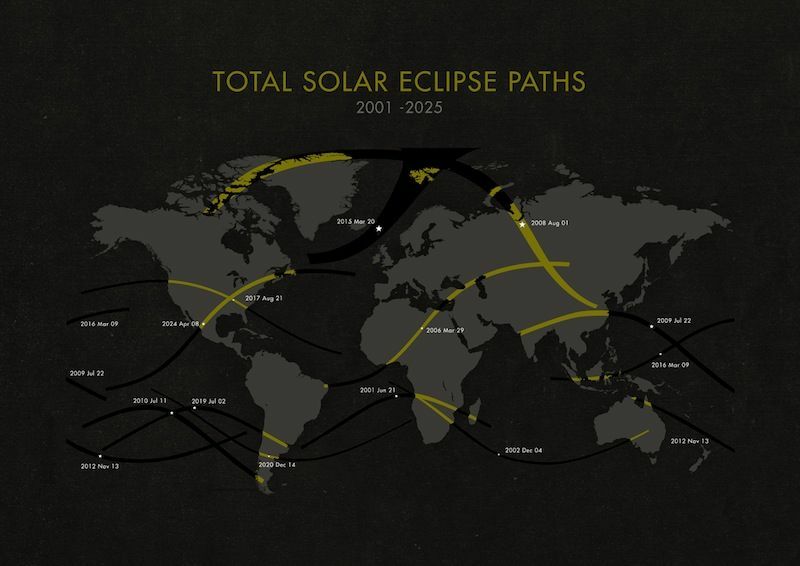 And it’ll be quite awhile until we see another, although it’s interesting that one spot in the SE part of the country will see TWO eclipses within a span of 8 years since there will be one more eclipse back east in 2024. And here is their map of the path. Notice how narrow the “zone” will be: Stayton and Madras are perfect, but it’ll be useless to be in the Portland metro area or Bend, they are outside of the path and it will not be totally dark. Rumor says most or all hotels have been booked up for next year for quite awhile. I’ve also heard much of remote Olallie Lake Resort is even booked! There is “no room at the inn” apparently in Madras where thousands (or many tens of thousands or a hundred thousand) will be congregating for the two minute show. Madras & Mitchell have the sunniest weather, on average, anywhere in the USA for this eclipse. I’ve even heard a rumor that there could be an extra million or more people congregating on that strip in Oregon that morning. Sounds like a traffic nightmare maybe? It is interesting that the two big state parks under the totality with a good chance for sunshine can’t be booked until late November (9 month window). I wonder how many people will be clicking like crazy on the Detroit Lake and Cove Palisades State Park website reservations on a cold and rainy November morning? Anyway, read up the eclipse and make your plans! This entry was posted on Sunday, August 21st, 2016 at 9:39 pm and is filed under Weather. You can follow any responses to this entry through the RSS 2.0 feed. Both comments and pings are currently closed. What a fantastic day it is. 74 at 1:00 PM. No low clouds today after a low of 51. Now 67 days in a row over 50 for a low. Record is 72 set in 2014 and 2015.This Summer really reminds me of 1987. The Winter that year was great. Peace. I was 11 that year thus I don’t remember it. How was it Dan? Portland to Salem? What a fabulous day! Where’s the “repeat for the rest of the month” button? I hope we’ll see something of the eclipse up here as well. I seem to recall the February 1979 event was with cloudy skies here too. I do remember noticing the street lights coming back on briefly- as it was sometime in the morning not long after sunrise. I plan to have an eclipse party that day.Last eclipse in 1979 was on a cloudy morning. Hopefully not 2017. 71 and sunny at 1:00 PM. Peace. I have a vacant lot in Madras. Maybe I should rent it out to campers! Up on a hill too! Don’t tell anyone but there is a third State Park right in perfect positon for this eclipse (Bates State Park), see you there. 54 overnight after a high of 71 yesterday. As far as the eclipse goes, I’m not making specific plans other than to see it. First, it’s uncertain where the best viewing will be; nobody can tell just where it will be cloudy a year out. Second, based on the stories of those who saw the 1979 eclipse, there won’t be huge concentrated crowds; the eclipse covers enough of a strip that it’s possible to spread out and find a place to view it. I’m planning on taking a big chunk of time off to allow for a road trip if one is needed to get to a clear area, and then to do dispersed camping on public lands somewhere the night before. 43.3 degrees this morning at my station in Battle Ground…a new August record low! Barely beats out 43.4 on the 25th in 2012. Not bad after being 102 two days ago. I have been planning on driving my oldest daughter to her college in Indiana next year and hitting some sights along the way, and I have had a rough draft of an itinerary for a few months now. As I started to plug in dates today to get her to school on time, I realized that we would be going through Missouri on the 21st! I’m going to tweak the route a bit to put us in a good spot to see the eclipse. Awesome it was, I was out working in a tree nursery at that time and we all stopped work to take it in. I heard about this a few years ago and put it on my calendar. Gotta figure out if it’s worth going somewhere to be in the dark. Sounds like it’ll be crazy busy!!! Renting a camper for the event, so no matter the driving hassles, I won’t have to find a spot, I’ll be there come hell or high traffic!